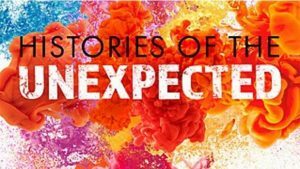 As a curtain raiser for Plymouth History Month, BBC’s Sam Willis and Plymouth University’s James Daybell present Histories of the Unexpected Live, the chart-topping, history podcast that features on Dan Snow’s History Hit Network, Histories of the Unexpected Live. There is a new buzz about history – the new rock and roll! Surely, there is nothing unexpected about the past? About history? Adopting a new approach to exploring our past, and moving away from the traditional linear plotting of battles, monarchs and political movements, Histories of the Unexpected argues that everything has a history. The history of the itch, the history of crawling, the history of clouds or of lightning, zombies, zebras, holes, perfume or rubbish – they all have fascinating histories of their own – histories that can change the way you think about the past and present. Sam and James electrify history for you, showing you how everything links in unexpected ways. It will blow your mind. Hi. Would this be at a level suitable for a 12 year old (year 7)? Yes this is suitable for those in year seven.